Honestly, this is so close to a classic potato salad that most people would hardly notice the difference. 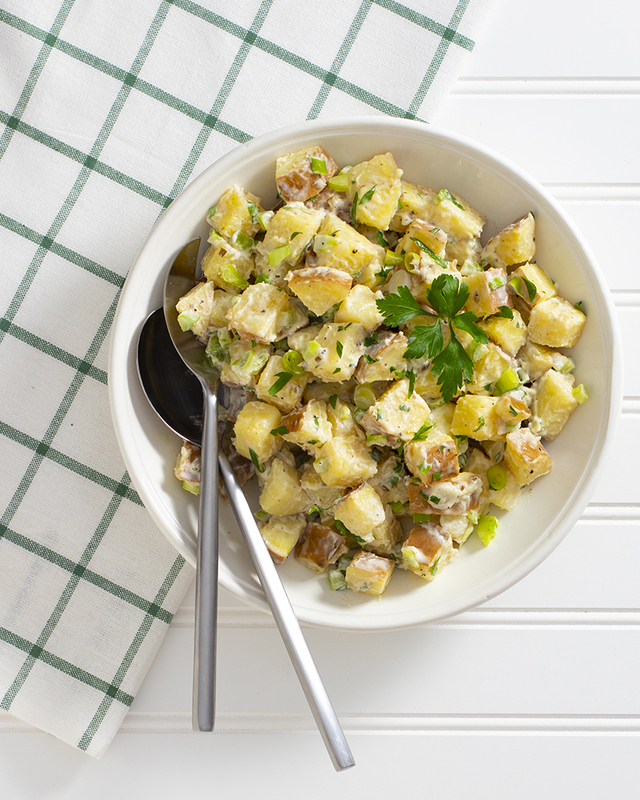 Whip up a batch and see if you don’t agree—it’s just as perfect for picnics, potlucks, and all your “regular” potato salad occasions. The secret to this salad’s disguise is yellow-fleshed sweetpotatoes—they’re a little less sweet, a little less moist, and a little more potato-like. In fact, you can substitute them in your own favorite potato salad recipe. Meanwhile, in a large bowl, combine the yogurt, vinegar, relish, salt, and pepper. Set aside. Once the sweetpotatoes come to a boil, reduce to a simmer, and continue to cook until tender, about 6 minutes. Drain and transfer to the bowl with the yogurt mixture, gently stirring to combine. Set aside to cool, gently stirring occasionally. Stir in the mayonnaise, celery, scallions, parsley, and additional vinegar, salt, and pepper to taste. Serve cold or room temperature.